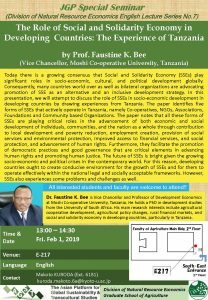 On the 1st of February 2019, as part of the Japan Gateway: Kyoto University Top Global Program (JGP), the Division of Natural Resource Economics will be holding a special seminar entitled “The Role of Social and Solidarity Economy in Developing Countries: The Experience of Tanzania” presented by Prof. Faustine K. Bee, Vice Chancellor of Moshi Co-operative University, Tanzania. All interested students and faculty are welcome to attend. No registration is required. [Venue] Room E-217, Faculty of Agriculture Main Bldg. Division of Natural Resource Economics, GSA.